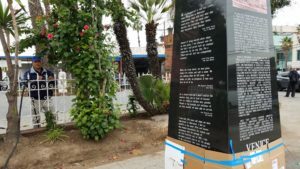 Felix Barron reads his letter to Rosendahl urging support for a permanent memorial marker at the corner of Venice and Lincoln. 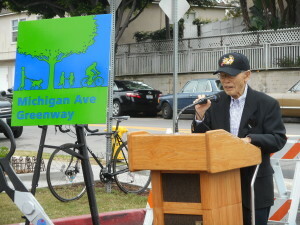 Arnold Maeda, VJAMM Committee Member, speaks of the significance of the VJAMM. 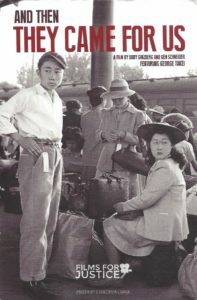 Bruce Kaji, Japanese American National Museum; Patricia Wakida, JANM; Phyllis Hayashibara, VJAMM; Doug Messerli, Sun and Moon Press, discuss “May Sky: There is Always Tomorrow,” haiku written by internees at assembly centers and American concentration camps. Aya Masada, Yosh Tomita, Brian Maeda Reverend John Iwohara, and Arnold Maeda attend the Press Event marking the site of the proposed VJAMM. 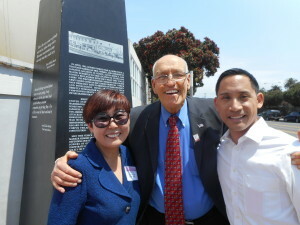 LA City Councilmember Bill Rosendahl, 11th District lends political and financial support for the VJAMM. 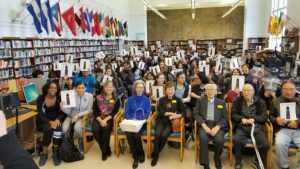 VJAMM Committee members and supporters and former Manzanar internees pose with Mrs. Hayashibara’s United States History students from Venice High School displaying their Japanese American internment haiku posters. 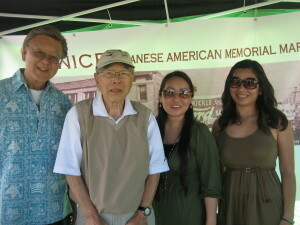 Former Manzanar internees Yosh and Arnold, and Venice HS graduates Akemi and Cindy staff VJAMM booth. VIP Reception guests enjoy Sushi Girl ® sushi, Feast from the East chicken salad, and Sakura cupcakes; with music from the Shoo Flies and the Songbird of Venice Suzy Williams and the Songbird of Manzanar Mary Nomura. 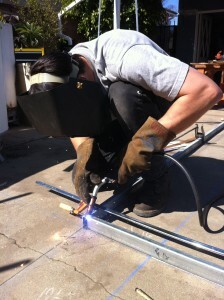 Eric Schmid welds the steel frame together and attaches casters for ease of movement. 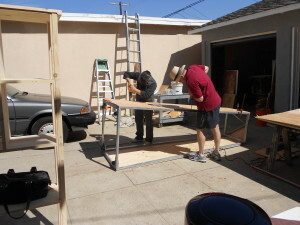 Apprentices Emily and Phyllis help Joe attach plywood to steel frame of VJAMM model. 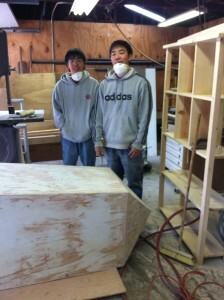 Dustin and Darren Noriyuki sand and prime the VJAMM model plywood. Dustin, Darren, Phyllis, Kay, and Emily sand and paint under Joe’s supervision. 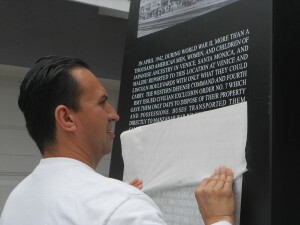 Jose expertly adheres lettering and images from Fast Signs on the VJAMM model. 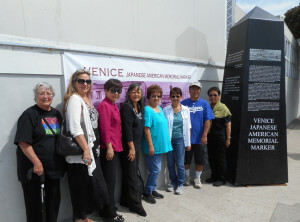 Former Manzanar internees and VJAMM Committee members pose with LA City Councilmember Bill Rosendahl, 11th District, and Manzanar National Historic Site Superintendent Les Inafuku with full-scale model of the VJAMM. 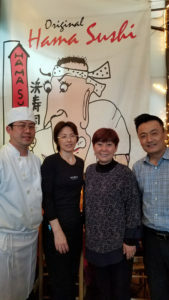 Esther Chaing of Hama Sushi in Venice donates 100% of the profits from the special bento lunch and 10% of all dinner sales to the VJAMM Committee. 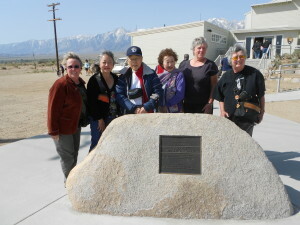 Cheryl, Phyllis, Arnold, Mae, Alice, and Emily meet Brian at the Manzanar Pilgrimage. 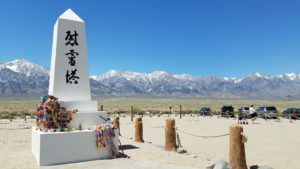 VJAMM Committee congratulates Mary Nomura, Songbird of Manzanar, as Parade Marshal at 72nd Annual Nisei Week Awards Dinner. 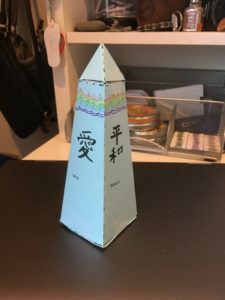 VJAMM thanks Naoko Matsumura, Kat Stewart, Esther and Jung Chaing, Tony Kim, and chefs Kinya Aota and Masayo Onuki for donating their expertise, and 100% of lunch profits and 10% of dinner sales! 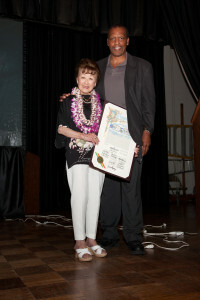 Marc Antonio Grant, Special Deputy to 11th District Councilmember Bill Rosendahl, presents Los Angeles City Resolution to Mae Kakehashi. 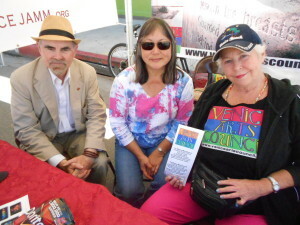 Richard Modiano of Beyond Baroque, Phyllis Hayashibara of VJAMM, and Regina Barton of Venice Arts Council staff the shared booth. 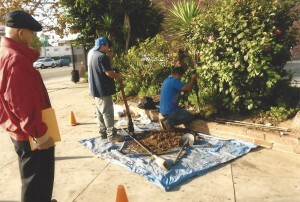 Yosh, Emily, and Arnold oversee taking soil samples with permission of Beach Cities Carwash operator Steve Spunt and property owner John Scherrer. 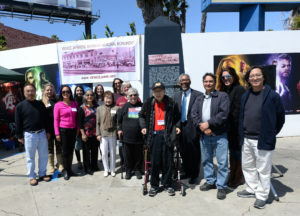 Emily, Suzanne, Esther, Phyllis, Judy, Aya, Edd, and June pose with the full-scale model of the VJAMM. 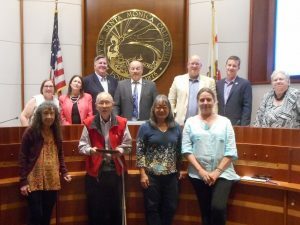 Len Nguyen, Senior Field Deputy to L A City Councilmember Mike Bonin, 11th District, presents donation pledge to VJAMM Committee members. 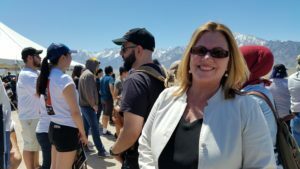 Melissa Ramoso, Senior Representative to California State Senator Ted Lieu, 28th District, calls the next day with news of Senator Lieu’s $5000 donation pledge to VJAMM Committee. 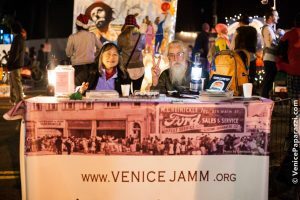 VJAMM displays posters, flyers, and postcards at the Abbott Kinney Festival booth shared by Beyond Baroque and the Venice Arts Council. 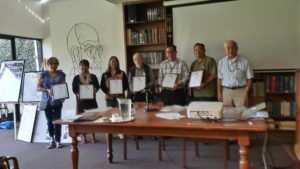 The VJAMM Committee congratulates the community on the dedication of the signage, and VJAMM Committee members help sponsor the reception of appreciation at the Japanese Institute of Sawtelle. 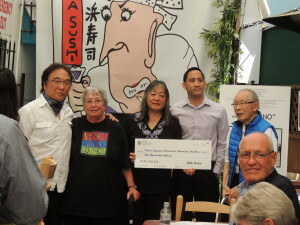 Esther Chaing, Bill Rosendahl, Len Nguyen continue their support of the VJAMM. 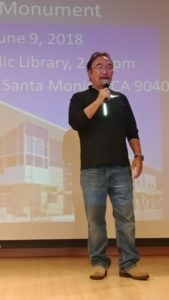 Arnold Maeda joins speakers James “MAC” McPherson and Paulina Sahagan who share their experiences growing up in their ethnically diverse Santa Monica neighborhood. 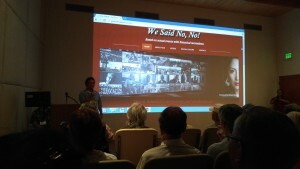 Brian Maeda presents www.wesaidnono.com, with video interviews of Tule Lake Segregation Center internees Bill Nishimura and Jimmy Yamaichi. 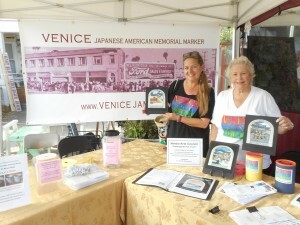 Suzanne Thompson and Regina Barton staff the Venice Arts Council and Venice Japanese American Memorial Monument Commiteee information booth. 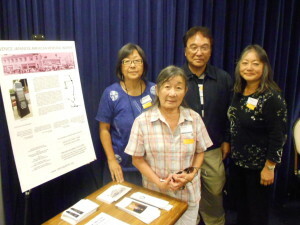 Phyllis Hayashibara and Zed Aquarian staff the VAC and VJAMM Committee information table. 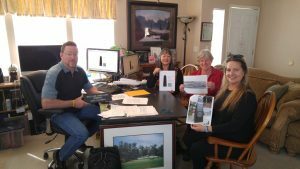 VJAMM Committee members Phyllis, Alice, and Suzanne hand-deliver the deposit check to David Williams. 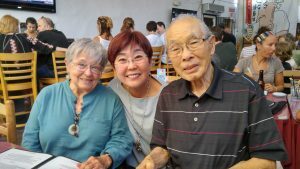 The Williams Family joins the fun at Hama Sushi, and David Williams speaks to the audience about his appreciation for history, and the importance of the VJAMM. 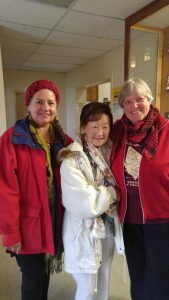 Suzanne, Mae, and Alice meet with Brian and Valerie for the weekend at Dow Villa in Lone Pine. Nikki baked a chocolate cake with banana and cream filling, and presented it to Arnold at the VJAMM Committee meeting at Emily’s. 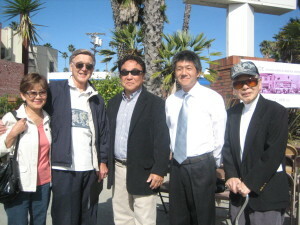 Committee members met at Esther Chaing’s Hama Sushi Restaurant in Venice for dinner. 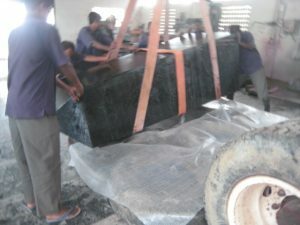 Workers in India shape, polish, drill, crate, and load the VJAMM obelisk into a shipping container, bound for port in the Bay Area. 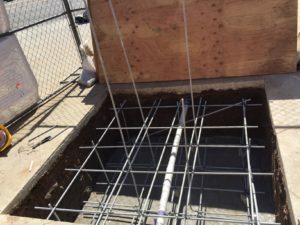 ETA first week of October, 2016. 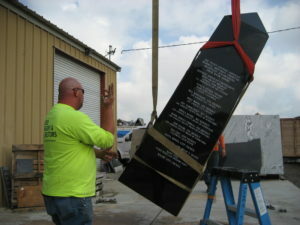 The VJAMM obelisk weighs 12,500 pounds. 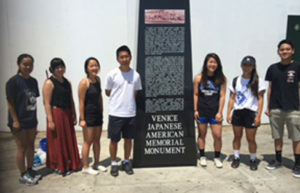 Abbot Kinney Festival Association Community Grants Program awards $1,700.00 to the VJAMM Committee to fund the development, layout, printing, advertisement, distribution, and website maintenance of the 5th 8th, 11th, and 12th grade curricula on the Japanese American internment and the Venice Japanese American Memorial Monument. Phyllis, Regina, Alice, Emily staff the VAC-VJAMM booth. 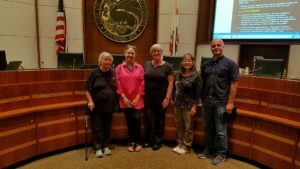 Dolores Sloan, Arnold Maeda, Phyllis Hayashibara, and Suzanne Thompson spoke for the VJAMM before Santa Monica City Council Members Gleam Davis, Sue Himmelrich, Kevin McKeown, Mayor Tony Vazquez, Mayor Pro Tem Ted Winterer, Council Members Terry O’Day and Pam O’Connor. 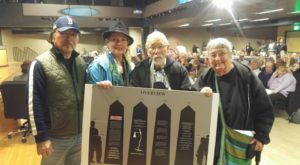 VJAMM Committee members pose in appreciation of the City Council’s understanding of the historic significance of the VJAMM and of their generous donation to the VJAMM. 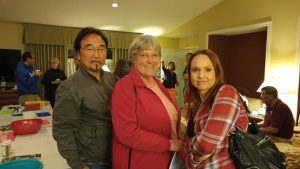 Suzanne, Emily, Warren, Alice, Brian party with the Manzanar Committee. 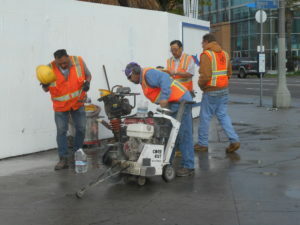 Benjamin Rizo, Jose Salas, Doug Fukuda, David Perka start sawcutting the concrete for the VJAMM foundation. 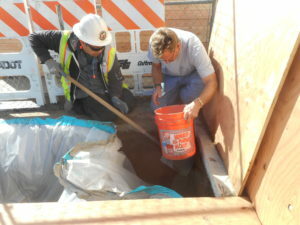 LA City GEO Engineer Shannon takes soil samples with David Perka’s assistance. 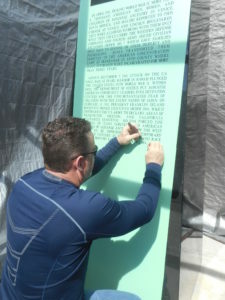 David Williams of Williams Monument Company in Arvin works on the stencils that will guide his sandblasting. 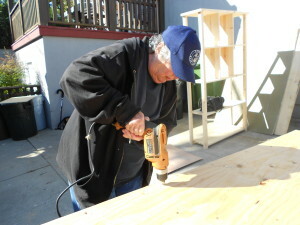 LA City’s David Perka supervises all phases of the VJAMM foundation. 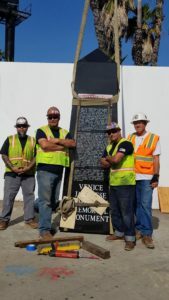 United Riggers and Erectors crane-lift the 12,500 pound solid granite VJAMM onto a flat bed truck for transport to Walnut until installation in Venice. 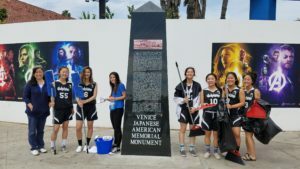 VJAMM Committee members Phyllis Hayashibara, Arnold Maeda Alice Stek, and Emily Winters witness the historic installation of the VJAMM obelisk from 8:00 am to 11:00 am. 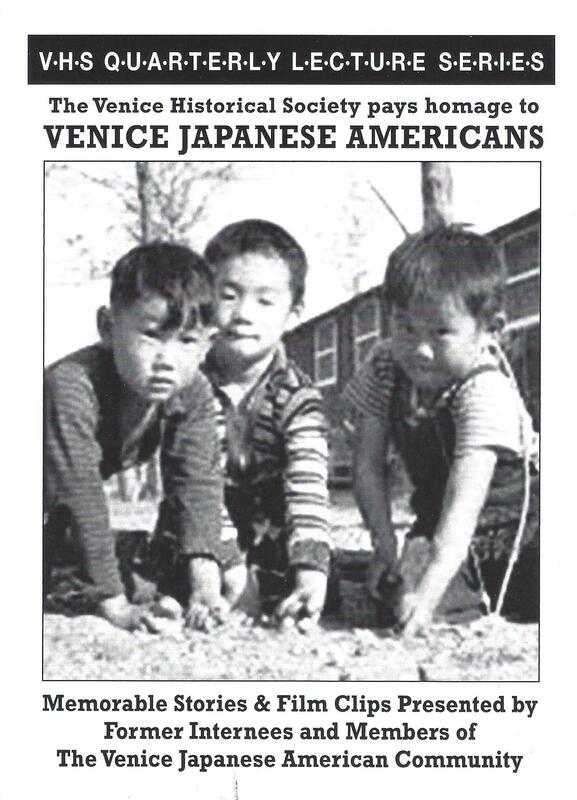 Bruce Baird, Femy, Jimmy Fukuhara, Ron Gee (thank you, Ron, for posting your album! 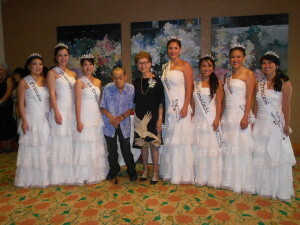 ), and Vincent Ramos join the spectators and photographers. 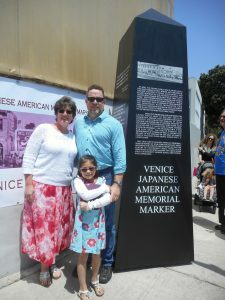 Thank you to Emily and David Williams of the Williams Monument Company; Tony, John, and Ruben of United Riggers & Erectors; Todd and Eric of The Permit Company; Hal of Anglemyer Crane; and David Perka of Los Angeles GSD Construction Forces Division for the amazing coordination of your professional efforts in the installation of the Venice Japanese American Memorial Monument! 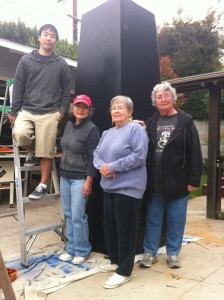 Emily and David Williams, Phyllis, Arnold, Alice, Emily Winters pose with the just-installed VJAMM. 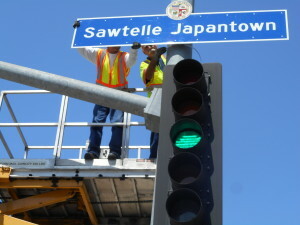 United Riggers and Erectors: Ruben, Tony, and John, with LA City’s David Perka, pose with the just-installed VJAMM. 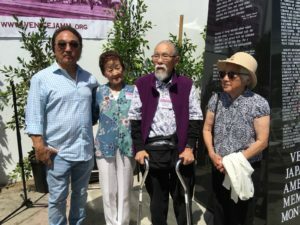 VJAMM Dedication on the northwest Corner of Venice and Lincoln from 10 am – 11:30 am draws 200 participants, including former Manzanar internees who provided quotes for the VJAMM: Brian Maeda, Mae Kakehashi, Arnold Maeda, and Amy Ioki. The late Yosh Tomita provided the fifth quote. 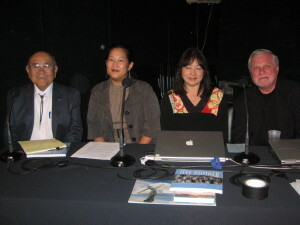 Brian Maeda, Mae Kakehashi, Arnold Maeda, Amy Ioki contributed poignant quotes for the VJAMM. 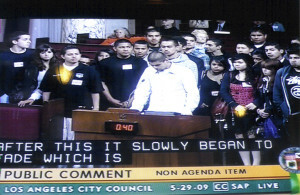 Len Nguyen addresses the audience of 200 on behalf of Los Angeles City Councilmember Mike Bonin, District 11. 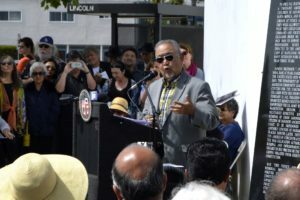 Warren Furutani delivers the keynote address. 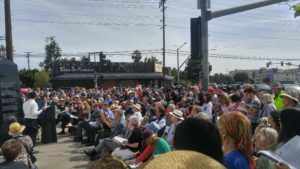 VJAMM Dedication speakers include: Jim Smith (Free Venice Beachhead), Ruth Galanter (former LA City Councilmember, District 6), Joel Jacinto (Board of Public Works Commissioner), Zev Yaroslavsky (former Los Angeles County Supervisor, District 3), Rachel Zaiden (Senior Field Deputy for LA County Supervisor Sheila Kuehl, District 3), Len Nguyen (Senior Field Deputy for LA City Councilmember Mike Bonin, District 11), Kevin McKeown (former Santa Monica City Mayor and current Councilmember), Jeff Burton (Manzanar National Historic Site), Dr. Jimmy Hara (born in Gila River, Arizona), and Dr. Thomas Yoshikawa (former Manzanar internee). 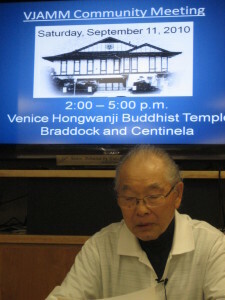 Warren Furutani, community activist and Manzanar Pilgrimage pioneer, delivers the VJAMM Dedication keynote address. 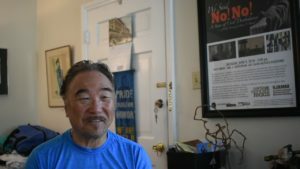 Warren Furutani mentions the VJAMM in his keynote address at the Manzanar Pilgrimage! 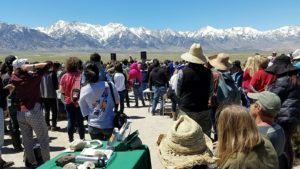 The 48th annual Manzanar Pilgrimage commemorates the 75th anniversary of Executive Order 9066 and draws over 2,000 participants. 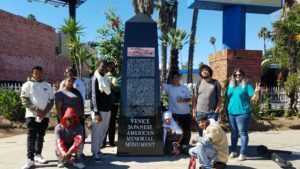 The VJAMM Committee receives a Certificate of Recognition from the Los Angeles City Board of Public Works for successfully building and installing the VJAMM, in partnership with the Board of Public Works and its Adopt-a- Median Program of the Office of Community Beautification. 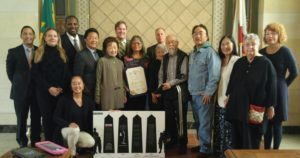 Los Angeles City Council 11th District Senior Field Deputy Len Nguyen, Suzanne Thompson, Commission President Pro Tempore Michael Davis, Jennifer Tomita (kneeling with poster), Commissioner Joel Jacinto, Mae Kakehashi, Commission President President Kevin James, Phyllis Hayashibara (with Certificate), Office of Community Beautification Director Paul Racs, Kay Brown, Arnold Maeda, Brian Maeda, Colleen Hoff (Mae’s daughter), Emily Winters, and Commission VP Heather Repenning pose with Certificate of Recognition and VJAMM poster. 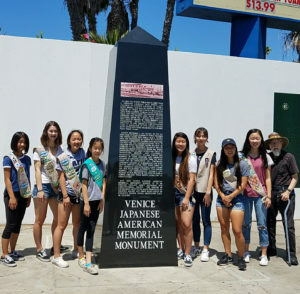 Senior and Junior Girls Scouts of Troop 5324 clean the VJAMM with Windex and sweep up sidewalk debris between the two bus shelters on Venice and Lincoln. 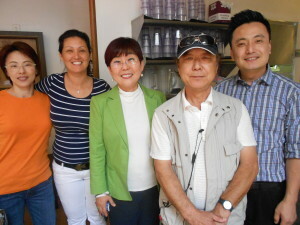 Esther Chaing of Hama Sushi Restaurant in Venice donates 100 pieces of sushi for lunch. 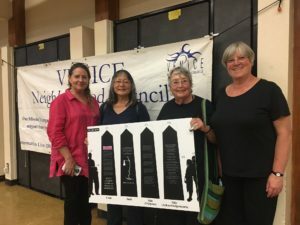 VJAMM Committee members Suzanne Thompson, Phyllis Hayashibara, Emily Winters, and Alice Stek thank the Venice Neighborhood Council at its meeting at Westminster School, for VNC’s unanimous support for the VJAMM on June 15, 2010, and for Ira Koslow’s motion for increasing funding for VJAMM’s Community Improvement Project to $1,300.00 on May 24, 2011. 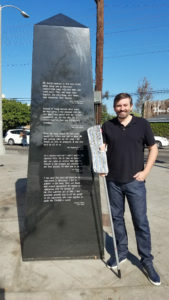 VJAMM distribute copies of the VJAMM Dedication Program, April 27, 2017 (one photo). 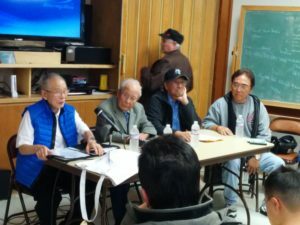 Arnold Maeda, Thomas Yoshikawa, Jimmy Hara tell of life before, during, and after their internment. 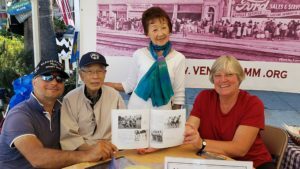 The Venice Historical Society organizes one of their quarterly lectures on the lives of Japanese Americans, before, during, and after World War II, and invited the former Manzanar incarcees to the Oakwood Recreation Center for a panel discussion. 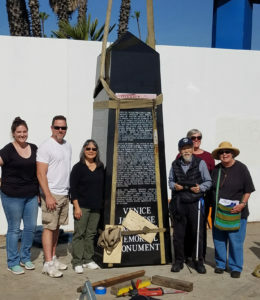 Over 70 people attend, and the Venice Historcial Society signs up 5 new members, which VHS President Jill Prestup considers a rousing success. 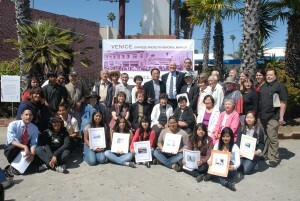 Councilmember Mike Bonin presents Certificate of Appreciation to the VJAMM Committee. 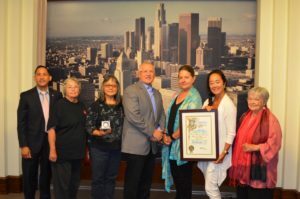 With 11th District Senior Field Deputy Len Nguyen, VJAMM Commitee members Emily Winters, Phyllis Hayashibara, Suzanne Thompson, Jennifer Tomita, and Kay Brown accept the framed Certificate of Appreciation and the Manzanar baseball from Los Angeles City Councilmember Mike Bonin. 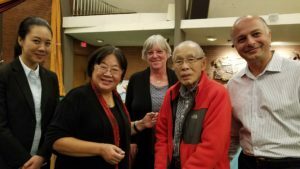 The VJAMM Committee presented the framed Certificate of Appreciation to Jennifer Tomita, in memory of her late father and VJAMM Commitee member Yosh Tomita. 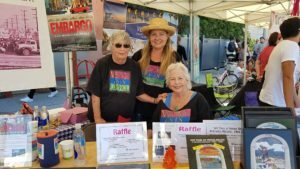 VJAMM Major donors and supporters include Alice Stek, Brian and Lucia Maeda, Esther Chaing; Ira Koslow with Gail Rogers. 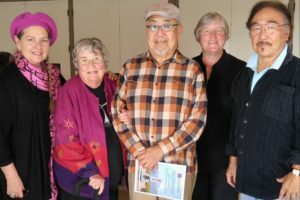 Alice Stek, Brian Maeda, Esther Chaing, Gail Rodgers, Ira Koslow, and Lucia Maeda attend the VJAMM Major Donors Appreciation Reception at Tomiko Yamato’s Craftsman home in Venice. 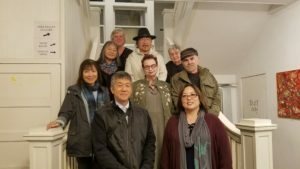 Speakers include Alice Stek, Betsy Butler, Ira Koslow, Dr. Thomas Yoshikawa, Kay Brown, Tomiko Yamato, and Phyllis Hayashibara. 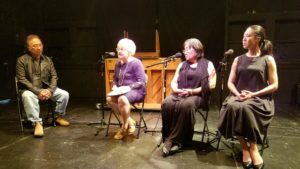 The Shoo Flies provided live music, Emily Wong played the koto, Amy Uyematsu read from her published collections of poetry; Mary Nomura, the Songbird of Manzanar, sang; Brian Maeda screened his newest trailer for his film, We Said NO NO. 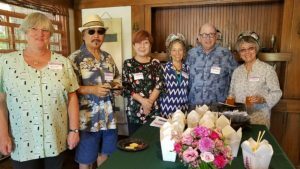 Refreshments courtesy of Sushi Girl, Feast from the East, Angel Maid, Rutt’s Hawaiian Cafe, and VJAMM Committee members. 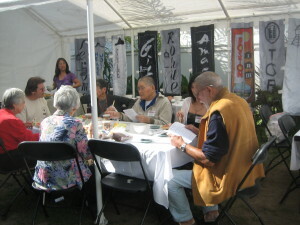 Tables and chairs courtesy of Los Angeles City Councilmember Mike Bonin of the 11th District, coordinated by Senior Field Deputy Len Nguyen. 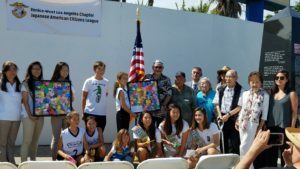 9/11 commemoration includes presentation of 1,000 cranes made by Camp Musubi (Tony Osumi, advisor) from Venice-West Los Angeles Japanese American Citizens League to Mohammed Abdul Aleem and his wife, Maleeha, of the King Fahad Mosque in Culver City. 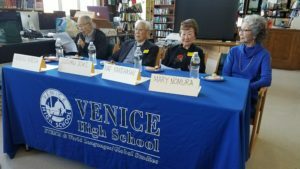 Venice-WLA JACL organizers: Amy Watanabe and Annia Yoshizumi; V-WLA JACL President John Saito and JACL Board members Ken Ota and Carole Yamakoshi. 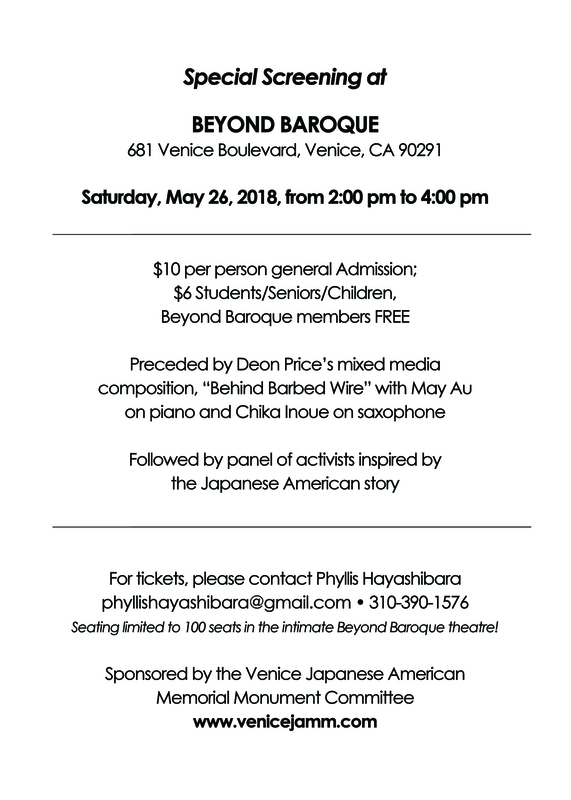 Taiko performance by Nakama Daiko led by Tomomi Hongo, flag salute by Girl Scout Troop 5325 (leader Victoria Yamashita), appearances by former camp incarcerees Jimmy Hara, Mae Kakehashi, Arnold Maeda, Jean Shigematsu, James Yamamoto. 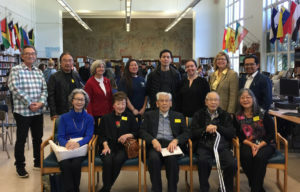 Greetings by V-WLA JACL President John Saito, Phyllis Hayashibara, VJAMM Committee; Len Nguyen, LA City Council District 11 Mike Bonin’s office; Stephanie Nitahara, National JACL Associate Director. 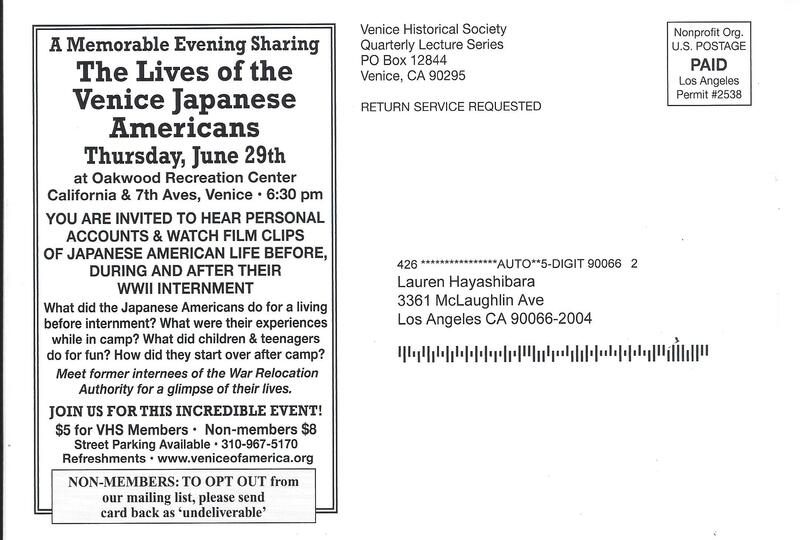 Keynote addresses delivered by Warren Furutani and Tanzila “Taz” Ahmed. 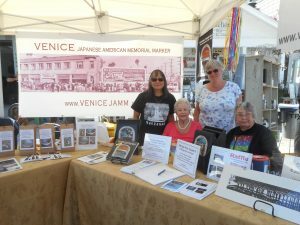 Fehmi Yildirim, Arnold Maeda, Mae Kakehashi, and Alice Stek staff the Abbot Kinney Festival Booth shared by the VJAMM Committee and the Venice Arts Council. 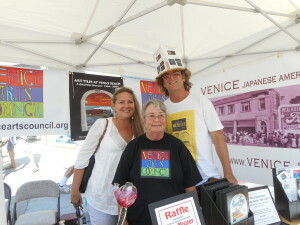 Emily Winters, Suzanne Thompson, and Regina Barton wear their Venice Arts Council T-shirts. 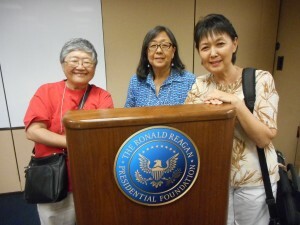 Amy Watanabe, Annia Yoshizumi, Phyllis Hayashibara, Suzanne Thompson, Joanne Tsuichika, Rie Watanabe, and Nabika Aleem kneel on the carpet in the men’s prayer room after 1 pm prayer service. 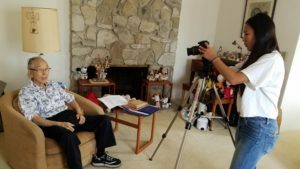 Dr. Jimmy Hara, standing between the framed cranes, shared the story of Sadako and the 1,000 cranes, and the world peace that the 1,000 cranes came to symbolize. 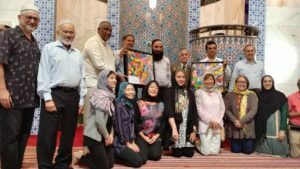 Mohammed Abdul Aleem and his family present to the King Fahad Mosque the framed 1,000 cranes from the Venice-West Los Angeles JACL. 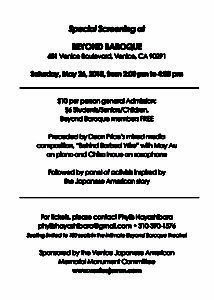 Yuki Yasuda, Dave Iwataki, Rumi Patterson, Henry Franklin, Don Littleton, Louis Van Taylor entertain and educate the appreciative audience. Dave Iwataki’s J-Town Bronzeville Suite brings traditional Japanese instruments to a jazz quartet, in commemoration of the Bronzeville era of J-Town, when African Americans moved into business and residential spaces in Little Tokyo after the forced removal and incarceration of persons of Japanese ancestry during World War II. Emily Winters and Phyllis Hayashibara attend the Los Angeles premiere of the 50-minute documentary by Abby Ginzburg and Ken Schneider, and determine to hold a screening on the westside, too (one photo). 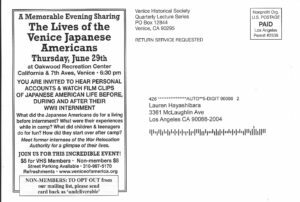 Alice Stek, Phyllis Hayashibara, Brian Maeda, Emily Winters, Amy Uyematsu, Laurel Ann Bogan, Richard Modiano, the Reverend John Iwohara, and Emily Kariya give voice to the haiku written by Japanese internees of assembly centers and American concentration camps. 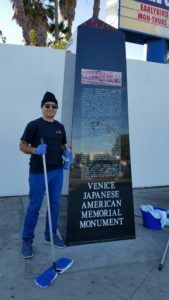 Venice Dolphins and Girls Scouts, with Girl Scout Troop Leader Victoria Yamashita, help polish the VJAMM and sweep up sidewalk debris. 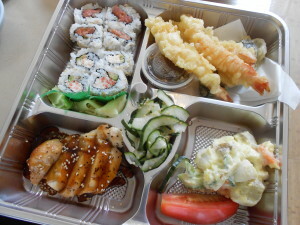 VJAMM 7th annual fundraiser at Hama Sushi sells out 264 bento orders at lunch! 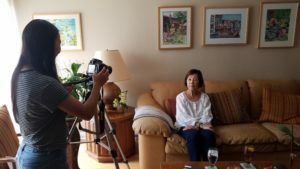 Esther Chaing donates 100% of the bento profits and 10% of all dinner sales to VJAMM. 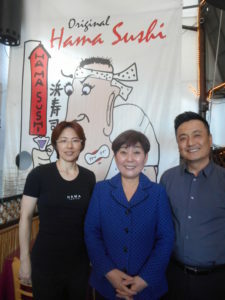 Thank you to Esther and Jung Chaing, Tony Kim, Naoko Matsumura, and Kenny Moon at Hama Sushi. 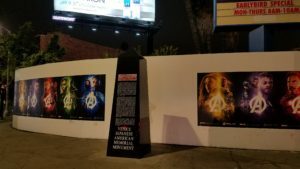 2018 April 24: LA DWP illuminates the VJAMM! 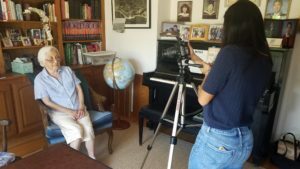 CEO and President of the Japanese American National Museum, Ann Burroughs, delivers a powerful keynote address about being arrested in her native South Africa, charged with treason for speaking against apartheid, and facing up to twenty years in prison. 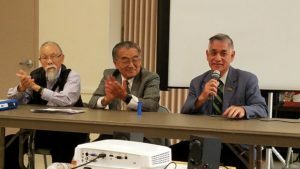 Brian Maeda moderates audience Q&A. 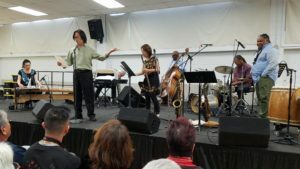 Deon Nielsen Price composed “Behind Barbed Wire,” for pianist Mary Au and saxophonist Chika Inoue. 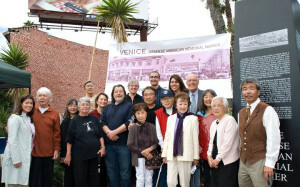 Brian screens preview of We Said NO NO, after Phyllis gives a brief history of the Venice Japanese American Memorial Monument. Audience sings Happy Birthday to Mae in celebration of her 95th. 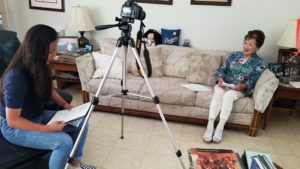 2018 July and August: Girl Scout Gold Award candidate, Lindsey, creates VJAMM Patch, model craft for kids, and interviews former Manzanar internees who contributed quotes for the VJAMM for a planned book and video. 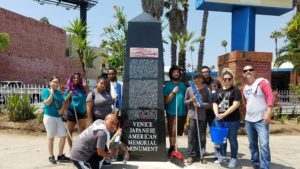 Nine young adults and two Youth Build Directors help polish the VJAMM and sweep up sidewalk and curbside debris. James Evans of James’ Beach donates grilled veggie sandwiches and tuna salad sandwiches for the volunteers. 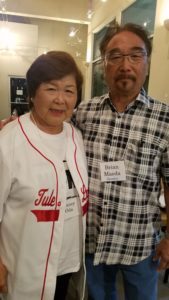 Nancy Oda, daughter of judo sensei Tatsuo Ryusei Inouye, unjustly imprisoned in the military stockade at Tule Lake Segregation Center; supports filmmaker and VJAMM Committee member Brian Maeda. 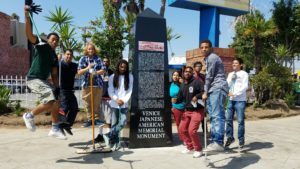 Venice Youth Build students jump for joy after cleaning the VJAMM and the surrounding sidewalk and street curbs. 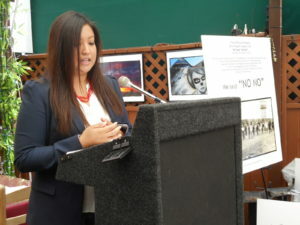 Janis Toya of Sakura Japanese Restaurant donates chicken teriyaki lunches with extra sauce, rice, and salad garnish. 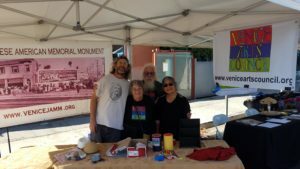 John Mooney, Emily Winters, Zed Aquarian, Phyllis Hayashibara set up at 8 am. 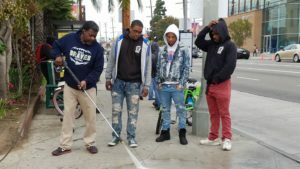 VHC’s Clarence Dorsey shows Durant, Nate, and Justice how to use the gas-powered pressure washer. Thank you to Gustavo of Beach Cities Carwash for providing the water. 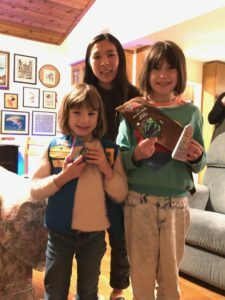 2019 January 6 Gold Award Girl Scout Lindsey presents VJAMM patches and previews her book, The Corner of Venice and Lincoln. 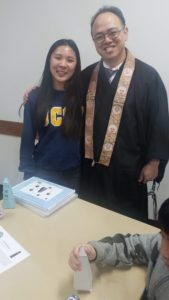 2019 February 10 Gold Award Girl Scout Lindsey presents VJAMM patches to Dharma School students, parents, and adult Temple members at the Venice Hongwanji Buddhist Temple. 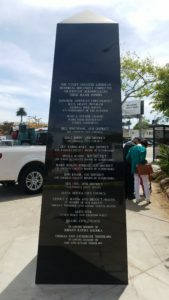 Arnold and Mae depart after David Williams completes the final major donor inscriptions on the VJAMM.